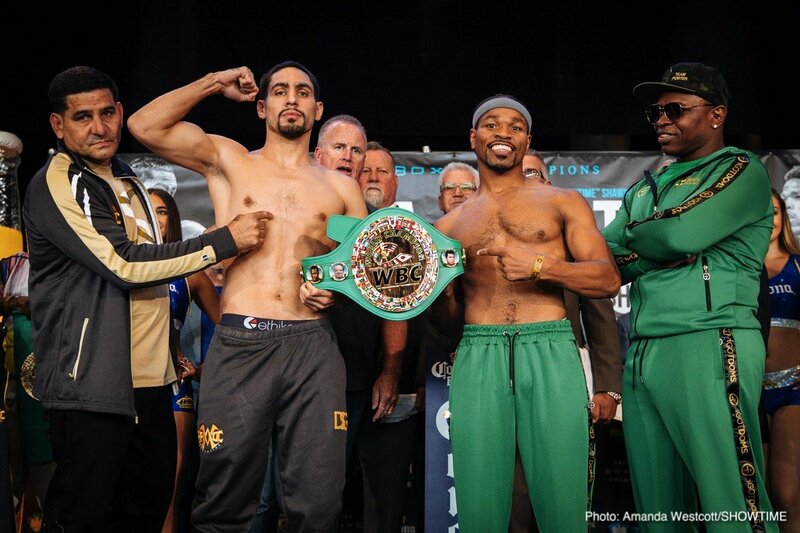 SHOWTIME Sports will provide live streams of official fight week events in advance of this Saturday’s WBC Welterweight World Championship between former champions Danny Garcia (34-1, 20 KOs) and Shawn Porter (28-2-1 17 KOs). The three-fight telecast airs live on SHOWTIME from Barclays Center in Brooklyn at 9 p.m. ET/6 p.m. PT. The SHOWTIME CHAMPIONSHIP BOXING telecast also features top 147-pound contender Yordenis Ugas (22-3, 11 KOs) battling against Argentine Cesar Barrionuevo (34-3-2, 24 KOs) in a WBC welterweight title eliminator showdown. Heavyweight contender Adam Kownacki (17-0, 14 KOs) and former champion Charles Martin (25-1-1, 23 KOs) will open the telecast with a 10-round attraction. In the livestreamed SHOWTIME CHAMPIONSHIP BOXING COUNTDOWN, Five-division champion Amanda Serrano (34-1-1, 26 KOs) will attempt to best her own women’s boxing record when she faces Yamila Esther Reynoso (11-4-3, 8 KOs) for the vacant WBO Junior Welterweight World Title. A win would make Serrano a six-division world champion, joining Manny Pacquiao and Oscar De La Hoya as boxing’s only six-division champions. Each live stream will be available for online outlets to embed via the SHO Sports YouTube channel and available for viewing on the SHOWTIME Boxing Facebook Page. YouTube links and embed codes are below. NOTE: SHOWTIME CHAMPIONSHIP BOXING COUNTDOWN will be geo-blocked for U.S. users only. Former Welterweight World Champion Danny Garcia takes you on his ring walk and explains how he prepares to enter the ring in this new digital offering from SHOWTIME Sports®. DANNY GARCIA: THE APPROACH provides insight into Garcia’s routine as he shares his thoughts before he climbs through the ropes. Garcia, the former unified 140-pound champion and former WBC welterweight titleholder, will meet the fan favorite and former welterweight champion Shawn Porter tomorrow night, September 8, live on SHOWTIME from Barclays Center, the home of BROOKLYN BOXING™. Live coverage of the SHOWTIME CHAMPIONSHIP BOXING begins at 9 p.m. ET/6 p.m. PT and also features Polish slugger Adam Kownacki and former heavyweight champion Charles Martin opening up the telecast with a 10-round heavyweight attraction. In the co-feature, 147-pound contender Yordenis Ugas will battle against Argentine power puncher Cesar Barrionuevo in a welterweight world-title eliminator showdown. The night kicks off with SHOWTIME CHAMPIONSHIP BOXING COUNTDOWN at 7 p.m. ET/4 p.m. PT as welterweight world champion Keith Thurman joins boxing broadcaster Ray Flores and analyst Chris Mannix to preview the night’s tripleheader and call live undercard bouts from ringside in Brooklyn. SHOWTIME’s seventh digital presentation of live boxing in 2018 will stream on the SHOWTIME Sports YouTube channel, and SHOWTIME Boxing Facebook page and will feature five-division champion Amanda Serrano as she embarks on a quest to conquer a title in a sixth weight class.